"I torture the poem, and myself, with corrections . . ."
Contained within this deceptively plain 1894 “Chandos Classics” edition of The poetical works of S.T. Coleridge, is a unique set of convergences and contradictions that equally display and confound the man it takes as a subject. Coleridge himself would likely abhor the comparison, but he shares much with his collection. In a letter written 1824 by Thomas Carlyle, Carlyle discusses a conversation he had with Coleridge as being, “a forest of thoughts, some true, many false, more part dubious, all of them ingenious in some degree, often in a high degree. But there is no method in his talk; he wanders like a man sailing among many currents” (Froude 179). What Carlyle observes in Coleridge is a riotous flux of ideas, battering against one another in competition for expression and justification from their speaker! Ironically, Coleridge was preoccupied throughout his career by a perceived lack of control over his works and public appearance, as his image was inseparable, according to his own conceptions of authorship, from the works themselves. The reasons for this obsession with control are bound up both in Coleridge's attempts to control his image, and in the goals of his literature. Coleridge was a strong proponent of the pedagogical value of literature, believing that writers had an obligation to teach, especially moral values, to the consuming masses. For Coleridge, perfecting a poem amounted to an exact expression of himself that held important educational value for his readers, but if something was amiss, then he did himself and his reader an injustice. To fully understand Coleridge’s position, a deeper exploration of the Romantic concept of authorship is required. The Romantic Movement was at the height of its influence from 1798, the publication date of the Lyrical Ballads, a collaborative book of poetry by Coleridge and William Wordsworth, until approximately 1850. Coleridge was among the founders of the Romantic Movement, and so too a major figure in changing conceptions of authorship forwarded by this group. Romantic authors felt that works arose from the original genius of a poetically inclined individual, making the source of inspiration internal: the self (Lenhart 2). What is termed “genius” above, is roughly synonymous with another concept coined by the Romantics, known as Imagination. In his seminal work, Biographia Literaria, Coleridge conceives of the Imagination primarily as “a repetition in the finite mind of the eternal act of creation in the infinite I AM,” which means that an artist’s inspiration, generated internally, is nearly as unique as divine creation (Coleridge 144). 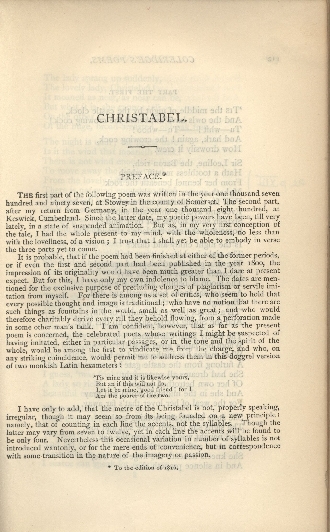 This position can be seen playing out in the preface to Christabel, pictured below, in which Coleridge defends himself against those who accuse him of being derivative by counter-charging that, the “set of critics, who seem to hold, that every possible thought and image is traditional ; . . . have no notion that there are such things as fountains in the world” (Coleridge, The poetical works, 111). Coleridge continues on in his preface to assert that he envisions his poetry as originating from himself, and believes that it is he alone who can give the poem wholeness and beauty (111). Further still, he admits that the kind of poetry he writes is inherently egotistical, because it springs from his feelings, and that the best writing is about one’s self (1). Following from this, Coleridge’s concern for himself as embodied by his literature grows more plausible as a valid concern. Coleridge worries and works throughout his career to create a unified whole that is representative of himself in his literature (Sangster 15). Matthew Sangster's work with Coleridge's many letters and public statements regarding authorship reinforces the prevailing conception of authorship at the time, in which Coleridge's works are largely taken to be him (5-9). Sometimes critics even went so far as to heft a work’s flaws off to the author and vice-versa (5-9). Coleridge was not alone in his concern, for the most important thing for a writer of his time, was to identify as a gentlemanly individual within society, (especially high-society,) or risk being ostracised by consumers (18). Writing was considered a questionable trade to begin with, looked down upon as lowly hackery, and at worst a wasteful and corrupting enterprise (Sangster 1-3 & Flint). Coleridge was himself such a staunch supporter of the above, that he is quoted as urging authors to, “Let literature be an honourable augmentation to your arms; but not constitute the coat, or fill the escutcheon” (Biographia Literaria, 112). This incessant concern for the expression of the appropriate self, led Coleridge to revise his works and hedge his opinions through annotations just as incessantly. 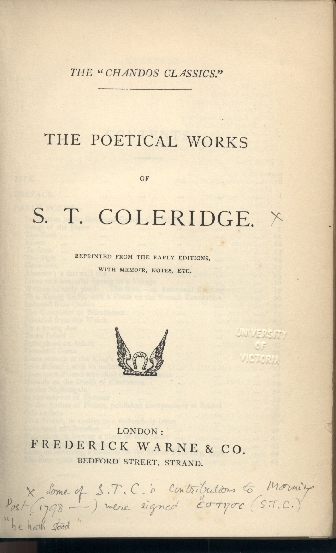 Turning again to the preface of Christabel, Coleridge is sure to let the reader know that Christabel was written in two parts, and in the act of self-depreciation, defends the value of the poem and himself from charges of plainness and imitation. The important thing is that Coleridge has presented himself appropriately, as humble, and even includes prescriptions about content and metre for the reader. It is very common for Coleridge to qualify his works in such a way, and as will be seen, he sometimes did so to his detriment. Authorial Footnote on "Religious Musings"
Second Authorial Footnote on "Religious Musings"
Looking to the images on the right, Coleridge has provided rigid annotations. 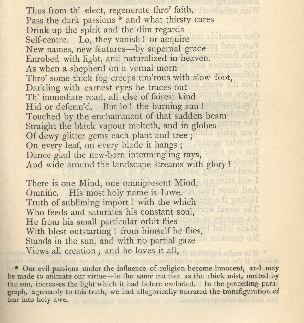 The first image shows a section of Coleridge’s seminal piece “Religious Musings,” “an ambitious poem intended to give Coleridge a reputation as a poet of the first rank” and intimately linked to his own moral and religious ideas (Collings 169). The annotation spells out the marked passage’s meaning, even providing extra clarifications, a moral prescription, and insight into the lines that follow it. The second image also shows an annotation to “Religious Musings,” which similarly qualifies and expands on the passage’s meaning, but again provides a didactic religious moral. Indeed, “Religious Musings” is a perfect example of Coleridge frantically scrambling to control the meaning of his work, as it took as its “ambition to write . . . an Enlightenment poem of moral philosophy on nature, man, and society” (169). Given what has already been shown of Coleridge, and that this poem was important to Coleridge as a statement of himself and his moral values, it follows it should be littered with revisions and annotations as it is. Early in his career, Coleridge stated in a letter that, “‘I torture the poem, and myself, with corrections; and what I write in an hour, I sometimes take two or three days in correcting . . . The Religious Musings, I have altered monstrously’” (Stillinger 104, original citation: Collected Letters, 1:309). Many of the poem's pages contain notes, most nearly 20 words in length or longer, and some more than 100 words. Although “Religious Musings” is a prime example of Coleridge’s moral revisions, this impetuous is not limited to strictly moralistic poems. 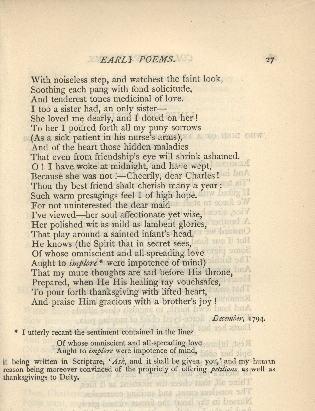 Authorial Footnote on "To Charles Lamb"
In the next image, a capture of the poem “To Charles Lamb,” Coleridge provides one of his most startling revisions. Here, Coleridge returns to his work and includes a note expressing his formal retraction of previously published lines. He goes on to provide an explanation of his new view on the subject, even giving evidence, “as though the poet felt the need to justify his work by appropriate sententiousness” (Stillinger 107). Coleridge has achieved his aim of revision, giving didactic and very narrowing commentary to the reader; there can be “no question about the existence of authorial intention in his subsequent stages of rewriting” (107). Clearly he cares deeply, not only for his image, but also for the moral and philosophical content of his work, believing his reader needs the correct lesson, and needs it explained to them. For Coleridge, “authorship would take shape not as career but as the vocation of public servant, who would speak . . . of the urgent demands of the nation” (Collings 172). The nation’s demand is for moral education, and Coleridge fancies himself as taking an active role as teacher. Coleridge has laboured to bring these poems into line with his own conception of literature, “But, having done this job once, he did it again and again” (Stillinger 107). How might Coleridge feel then, when his ability to actively control his works has gone? For Coleridge, revision was an active and ongoing process, always related to his changing intentions and self-appointed role as teacher. However, this has some limiting implications for the current edition, since, as it stands, it radically removes Coleridge from his works. This edition, like most posthumously published collections, seals Coleridge's poems into a “final version,” a state which he arguably never saw his poems taking. To collect Coleridge’s works into a static, final form, effectively neuters the man whose corpus is then removed from his corpus. Collection severs Coleridge’s control over the reception, use, interpretation, and even content of his poems, which relied so heavily on their author for, in turn, their own intention, moral, and image. Although every collection stands to exclude its author, the severity of the offence is especially terrible for Coleridge, who felt authorial control and revision essential to his expression. Given the evolving nature of his works, they can no longer be taken as an accurate expression of Coleridge, confounding his presence in the edition even further. “Hence, his work gives us too many separate versions of text and, if we are looking for them, possibly too many authorial intentions among the versions” (Stillinger 107). Although his collected works give the outward impression of wholeness and unity, it cannot truly be anything else but a discordant mash of the author, silenced mid-sentence. Nevertheless, as was noted earlier, this edition both uniquely bewilders and uniquely supports Coleridge as author. Although this edition is dangerous to Coleridge's percieved author-image, it is not antithetical to him. The series in which this edition is published, the Chandos Classics series, had the goal of making good, moral literature available to many. The publisher, Frederick Warne, had two key editorial goals: “wholesome entertainment and reasonable prices” (Golden). To this end, “In 1868, emulating Routledge's [a former partner,] aim to popularise time-honoured literature, he inaugurated the Chandos Classics, an enormously well-liked series of ultimately 154 titles” (Golden). Coleridge could not help but be impressed by the aim and scope of the series, especially since during his own time, relatively few people could read Romantic poetry (Eliot). 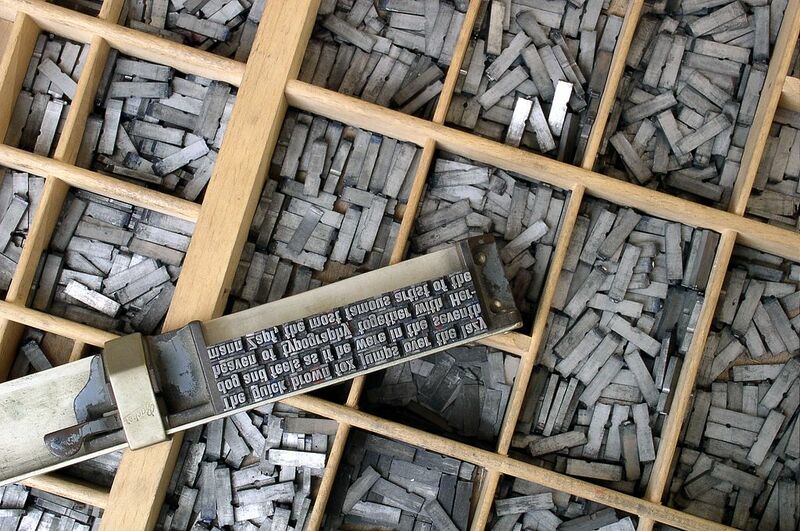 In fact, very few would have had access to the texts at all, since print runs were both limited and expensive. The common practice was for publisher’s to ensure that all possible sales at the initial high price had ceased before reissuing cheaper editions, thus removing Coleridge’s work from the hands of the layman he so desperately sought to enlighten (Eliot). However, now that Warne has made Coleridge affordable, the publisher and price can no longer exert “a form of cultural friction that slowed down the transmission of new texts” and ideas (Eliot). Quite the opposite, around the time of this edition’s publication, a drive to produce books like it was in full swing. Following the 1870 Education Act in Britain, which for the first time required children ages five to twelve to attend school, a call went out for textbooks and anthologies that could be used for educating (Flint). The poetical works falls very much into this category, and combining this with the original goals of the series, and the fact that “by 1900 the percentage of literates was 97.2 men, and 96.8 women,” Coleridge could not help but be satisfied (Flint). The obstacles that Coleridge faced in his own time are swept aside: Coleridge is widely available at a cheap price to the literate masses who now respect authorship and wish to learn. So although the format is not agreeable to Coleridge, the goals of the Chandos Classics series are synonymous with his own, and the inimitable position of the edition enriched. However, the full extent to which Coleridge interacts with his text is yet to be seen. 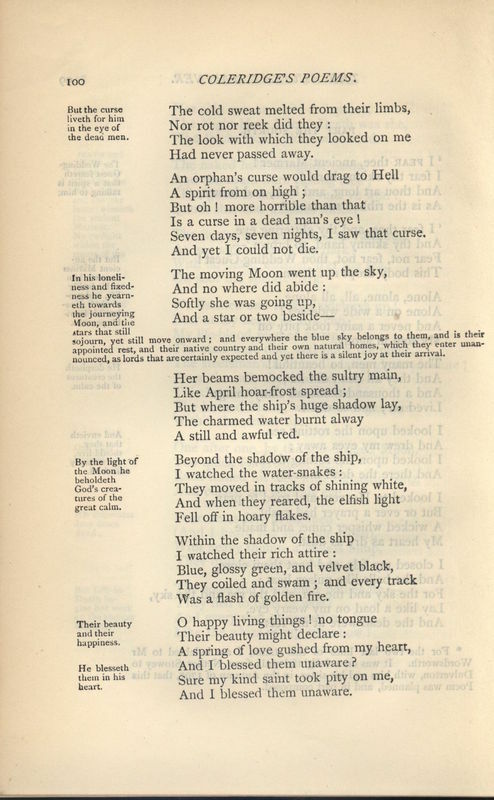 The Argument Pierces a Section of "The Rime of the Ancient Mariner"
Clearly Frederick Warne’s goal of distributing wholesome literature is one shared by Coleridge, but despite this, or perhaps despite himself, Coleridge may have been nervous to know his literature would be read so widely. In a letter written to the Edinburgh Review in defense of a fellow writer, Coleridge argued that he was himself above the deficient criticisms of popular opinion, and that he did not heed the public in regard to his work (Sangster 11-14). He goes on to say that he believes a small, intimate group of companions is the surest judge of his work, and that all works are judged best in this way (11-14). Here can be seen another expression of Coleridge’s anxiety of control, in which he wishes his works in the hands of only his personal circle, thus ensuring their interpretation according to his own rubric. However, this also opens a new avenue of conflict similar to the contradiction between the denial of a static text and desire for pedagogical impact. Although Coleridge believes he wants to teach, his real goal is to preach. Coleridge simply cannot fathom relinquishing ownership of his works, and through them himself and his moral worldview, causing his drive to enlighten the nation to run ashore against his obsession with correct conveyance. Yet the present edition and Coleridge are not done contradicting themselves. In the edition’s authorial preface, Coleridge says that “There is one species of egotism which is truly disgusting . . . that which would reduce the feelings of others to an identity with our own” (2). Coleridge warns against forcing or dismissing one personal interpretation in favour of one’s own, right in the book’s preface! Again in the preface to “The Wanderings of Cain,” Coleridge acknowledges that he feels it “impracticable, for a mind so eminently original, to compose another man’s thoughts and fancies” (239). According to these statements, each mind is itself unique, separate, and to a high degree the measure of itself. Following this, the public should be able to interpret and learn from Coleridge as they please, yet Coleridge cannot allow them to. Above is an image from Coleridge’s famous long-poem “The Rime of the Ancient Mariner,” and its equally famous Argument. The sections of text along the left of the page, called the Argument, dogmatically spell out the meaning and actions taking place in accompanying lines of verse. 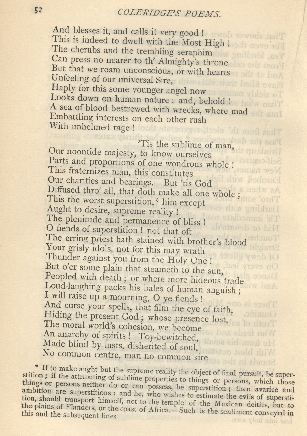 The poem is escorted by the Argument start to finish, and as shown mid-page, even pierces the body of the poem. Coleridge’s annotations literary interrupt the poem’s stanzas, further proving the severity of Coleridge’s craving for control, and his refusal to allow meaning to escape his grasp, even to the point of crushing it in his grip. In the end, Coleridge’s greedy clutching together of himself only negates the advantages handed to him by time and by Warne. Coleridge must teach the nation, but they must not be allowed the ability to interpret, he must prescribe the correct meaning and image to the poem, but to settle on a final form would remove his control of those very components. Coleridge splatters himself all throughout his poetical works, revelling in the Romantic conception of authorship by sustaining control over his works through intense revision and moral prescription. Yet now that only the traces of his desired power over the text remain, he is lost to it. The finality of a collected works destroys the spirit of Coleridge that flourished only under the living author’s fluctuating hand, stopping his mouth with dirt. Despite this violence of form, the Chandos Classics edition extends its hand to Coleridge in its ethos by mirroring his wish to enlighten the nation through morally upstanding literature. The importance of the Chandos Classics series to Coleridge collections should not be overlooked, as for the first time it provides the possibility of wide distribution and moral scaffolding absent from other collections. Even then, when it seems Coleridge might be pacified by the series, his own words from within the text, which passes him silenced into the hands of the many, surface to confound him. Coleridge still cannot let go, refusing to allow the chance his work might be misinterpreted, and so too himself through it. Ironically, “The difficulty of finding a principle of coherence in Coleridge's collected texts suggests that they unsettle the very idea of the writer's career, in which the author fashions a body of work distinguished by a unique voice, style, or concern” (Collings 167). Characteristically it seems, Coleridge would flip in his grave to hear such a thing said, yet his own work confirms it. The poetical works of S.T. Coleridge does well in reflecting the character of Coleridge then, which is itself tangled and at times self-contradictory, swung in too many directions by the intentions of its contributors. The final irony is that although Coleridge would jump against the bars of his collected works, it may be that captivity is what is best for him. At least then the layers of discordant revision cease to echo again and again, meeting each other in roars of destructive interference. Coleridge, Samuel Taylor. Biographia literaria : or, Biographical sketches of my literary life and opinions : and two lay sermons: I. The statesman's manual: II. Blessed are ye that sow beside all waters. Kelly Library, Toronto, G. Bell, 1817. Collings, David. “Coleridge Beginning a Career: Desultory Authorship in Religious Musings.” ELH, vol. 58, no. 1, 1991, pp. 167–193. Eliot, Simon. “The Business of Victorian Publishing.” The Cambridge Companion to the Victorian Novel Cambridge, edited by David, Deirdre, Cambridge University Press, 2010, pp. 37-60. Flint, Kate. “The Victorian Novel and its Readers.” The Cambridge Companion to the Victorian Novel Cambridge, edited by David, Deirdre, Cambridge University Press, 2010, pp. 17-36. Froude, Anthony James. Thomas Carlyle: A History of the First Forty Years of Life, 1795-1835, Volume 1. Charles Scribner’s Sons, 1882. Golden, Catherine J.. “Warne, Frederick (1825–1901).” Oxford Dictionary of National Biography, edited by David Cannadine, Online ed., Oxford: OUP, 2004. Lenhart, Laura R. “Normative Notions of Authorship and Participation in the iSociety.” School of Information Resources and Library Science, University of Arizona, pp. 1-6. Stillinger, Jack. Coleridge and Textual Instability. Oxford University Press, 1994.